“We don’t have money for that kind of stuff,” said the girl. At that moment, Blick was newly determined to level the playing field. 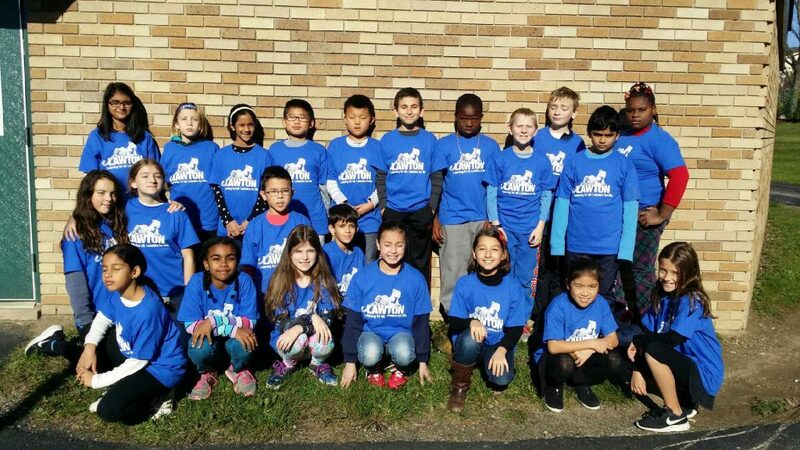 Fifth graders model their spirit t-shirts, which the PTO provided for every student at Lawton this year. Newly elected PTO co-presidents Lindsay Bliven and Monica Davis were also concerned about what more they could all do to make sure every student felt like a Lawton Leopard rather than someone whose family had less. Bliven said that one of the most significant characteristics of Lawton is the feeling of community that is created by all of the Lawton families. 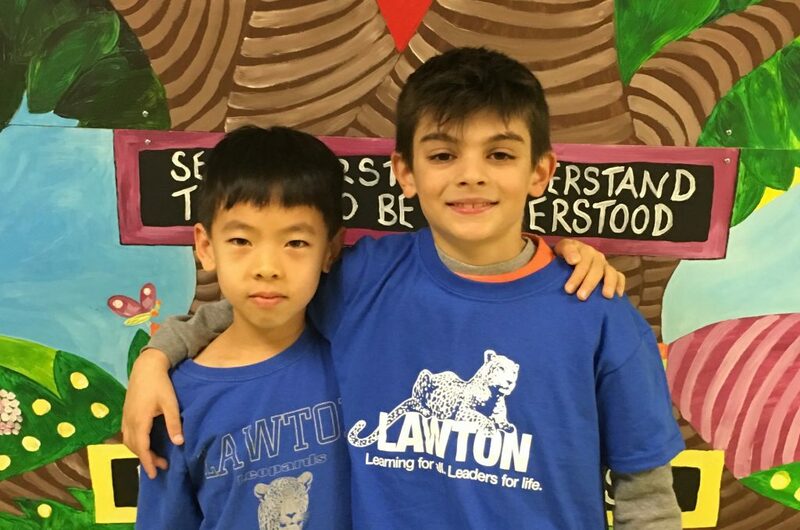 Davis explained that the first PTO project was to provide a free Lawton t-shirt to each student, so all of the students can participate in Spirit Fridays. Blick said the administration had tried previously through grants to supply all shirts, but hadn’t reached everyone. About 40 of the school’s 500 students receive free or reduced lunches—which is one of the lowest percentages in the district. Now those students will not feel left out of anything offered to every other Lawton Leopard, Blick said. The PTO is also planning to hold monthly community building events free to students and families. A few anonymous donors offered the chance for students with fewer resources the opportunity to select a new book of their choice at the Scholastic Book Fair, as well as to receive a yearbook at the end of the year—both free of charge. Blick said that while she loves the book fair, it never did sit right with her. She said it was heart-warming to watch the students this year picking out their free books. 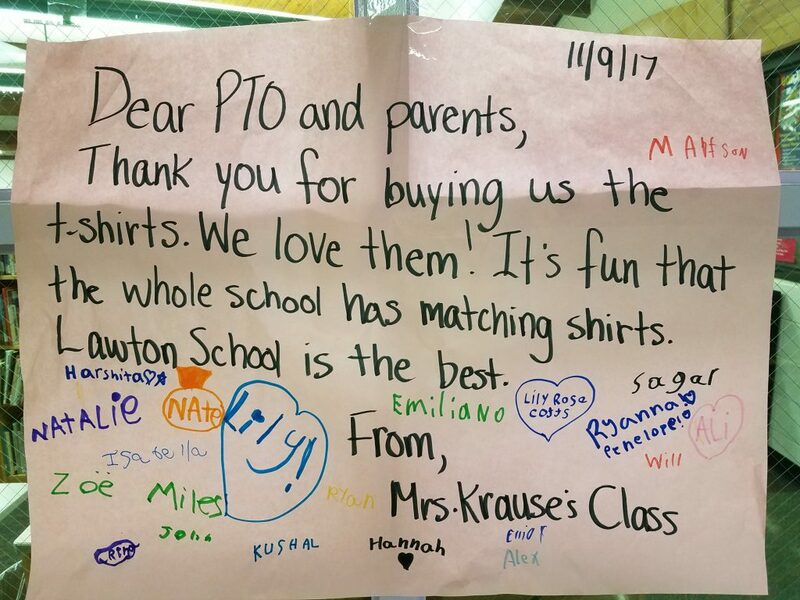 In early October, an anonymous donor made sure all kids who needed them received a shirt to wear to the 2017 Lawton Runathon to benefit the John Crosby Memorial Foundation and the Lawton PTO. Events such as our community building monthly experiences wouldn’t be possible without the generosity of Lawton families and local businesses that include Tippins Market, Cottage Inn, and Panera Bread, Bliven and Davis said. “The momentum at Lawton is amazing and continues to move forward our PTO vision as we are constantly developing new ideas,” said Davis. I agree with the spirit of leveling the playing field and being inclusive. I didn’t like seeing that only black children were photographed for this article that highlights those who are unable to afford tshirts and books and receive free and reduced lunch. I don’t think that kids who received free books should be poster children in this article. I think it’s exploitive and unnecessary and their appreciation could have been expressed without them being identified. Thank you for your feedback. The story and pictures have been changed to reflect your concerns.